The Code 29 error is one of several Device Manager error codes. It means that the hardware device is disabled at the hardware level. In other words, Windows sees that the device exists in the computer but the hardware itself is essentially "turned off." 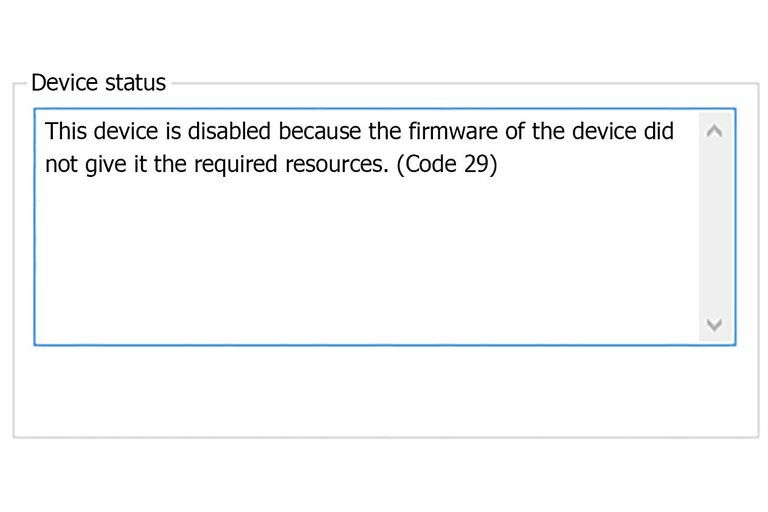 Details on Device Manager error codes like Code 29 are available in the Device Status area in the device's properties. This information is viewable within Device Manager. Device Manager error codes are exclusive to Device Manager. If you see the Code 29 error elsewhere in Windows, chances are it's a system error code which you should not troubleshoot as a Device Manager issue. Others might be related to an iTunes device restore issue. The Code 29 error could apply to any hardware device in Device Manager. However, most Code 29 errors appear on devices that are often integrated onto the motherboard like video, sound, network, USB, and more. Any of Microsoft's operating systems could experience a Code 29 Device Manager error, including Windows 10, Windows 8, Windows 7, Windows Vista, Windows XP, and more. The error Code 29 you're seeing might simply be caused by a temporary problem with the hardware. If so, a restart of your computer could be all you need to fix the Code 29 error. Did you install a device or make a change in Device Manager just before the Code 29 error appeared? If so, it's highly likely that the change you made caused the Code 29 error. Undo the change if you can, restart your computer, and then check again for the Code 29 error. Removing or reconfiguring the newly installed device. Rolling back the driver to a version prior to your update. Using System Restore to undo recent Device Manager related changes. Enable the device in BIOS. In most cases, this will fix a Code 29 error. For example, if the Code 29 error is appearing on a sound or audio device, enter BIOS and enable the integrated sound feature on the motherboard. There may be additional ways in which a hardware device is disabled aside from a BIOS option. For example, some cards or motherboard features may have jumpers or DIP switches that are used to enable and disable themselves. Clear the CMOS. Clearing the CMOS on your motherboard will return the BIOS settings to their factory default levels. A BIOS misconfiguration could be the reason that a piece of hardware is disabled or not able to supply resources. If clearing CMOS does stop the Code 29 error from appearing, but only temporarily, consider replacing the CMOS battery. Reseat the expansion card that is reporting the Code 29 error, assuming of course that the device is, in fact, an expansion card. A hardware device that isn't seated properly in its expansion slot could still be recognized by Windows but would not work properly. If the device with the Code 29 error is integrated into the motherboard you can skip this step. Update BIOS. The combination of a particular BIOS version, a particular set of hardware, on a particular Windows setup might be causing an issue that's generating the Code 29 error. If your motherboard has a newer BIOS version than the one you're using, update it and see if that corrects the Code 29 issue. Reinstall the drivers for the device. A driver issue isn't likely the cause of a Code 29 error but it is possible and you should reinstall the drivers just be sure. Correctly reinstalling a driver, as in the instructions linked above, is not the same as simply updating a driver. A full driver reinstall involves completely removing the currently installed driver and then letting Windows install it over again from scratch. Update the drivers for the device. Installing the latest drivers for a device is another possible (though unlikely) fix for a Code 29 error. Replace the hardware. If none of the previous troubleshooting has worked, you might need to replace the hardware that has the Code 29 error. If you're sure that the hardware itself isn't the cause of this particular Code 29 error, you could try a repair install of Windows and then a clean install of Windows if the repair didn't work. It's not recommended doing either of those before you try replacing the hardware, but they may be your only options left. To ensure the quality of this page, please vote whether any of these tips were helpful in fixing your issue. If you're not interested in fixing this Code 29 problem yourself, even with help, see How Do I Get My Computer Fixed? for a full list of your support options, plus help with everything along the way like figuring out repair costs, getting your files off, choosing a repair service, and a whole lot more.